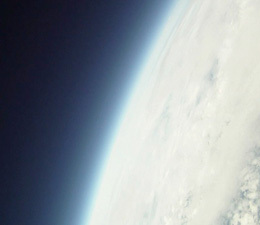 They took a weather balloon up to 100,000 feet (30km) where the balloon bursts due to low pressure and land using a parachute. The location of the camera would be found using the iPhone GPS and data connectivity to send the coordinates. Temperatures are as low as 50 degrees Celsius below zero and the speed of descent could reach up to 251 kmph!